Interim Dean Bruce Wintroub announced the appointment of Wendell Lim, PhD, as the new chair of the Department of Cellular and Molecular Pharmacology (CMP). 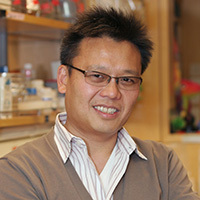 In addition to his appointment as professor and chair of CMP, Dr. Lim is director of the UCSF Center for Systems and Synthetic Biology, director of the UCSF/UC Berkeley NIH Nanomedicine Development Center, and deputy director of the National Science Foundation Synthetic Biology Engineering Research Center (SynBERC). He is also a current Howard Hughes Medical Institute investigator. Dr. Lim is a biochemist and cell biologist pursuing research to understand how living cells use molecular networks to process information and make decisions. His laboratory uses biochemical, structural, genetic, computational and engineering approaches to elucidate the mechanism of signaling proteins and networks. In addition, his lab is interested in understanding how signaling modules can be used to generate new cellular functions, either through evolution or engineering. Dr. Lim received his AB in Chemistry from Harvard University and his PhD in Biochemistry and Biophysics from Massachusetts Institute of Technology. After completing a postdoc at Yale University, Dr. Lim joined UCSF in 1996. He has received many honors and distinguished recognition throughout his career; in 2014, Dr. Lim received an NIH Director’s Transformative Research Award, designed to support the “high-risk, high-reward” work of exceptionally creative scientists, to focus on engineering precision therapeutic immune cells to treat cancer. He serves on the editorial boards of Cell, Quantitative Biology and ACS Synthetic Biology; co-authored a National Academy of Sciences report as part of the Committee on a New Biology for the 21st Century; and has recently co-authored an innovative new textbook, Cell Signaling: Principles and Mechanisms, published by Garland Science. In addition to mentoring graduate students and postdocs, Dr. Lim teaches summer undergraduate and high school students and coordinates the UCSF-Lincoln High School iGEM summer research program. As chair of the CMP department, Dr. Lim will guide and foster the further growth, development and national recognition of its educational and research programs. Dr. Lim has assumed his new position effective January 1, 2015. Outgoing chair Dr. Kevan Shokat has led the department since 2010. During his tenure, CMP was the UCSF department with the highest proportion of faculty elected to the National Academy of Sciences and the highest proportion supported by the Howard Hughes Medical Institute. At the same time, CMP faculty continued to win awards for their teaching in the medical curriculum and distinguish themselves in graduate teaching at UCSF and in innovative outreach programs elsewhere.